Apothecary Rose plant, Rosa gallica var. officinalis, is sometimes known as French Rose. Glorious magenta in colour with exquisite perfume. Favoured rose of monastical herberies of the middle ages. Probably brought back from the Seventh Crusade where it became the basis of a vast medicinal industry. The floral symbol of the House of Lancaster during the War of the Roses. 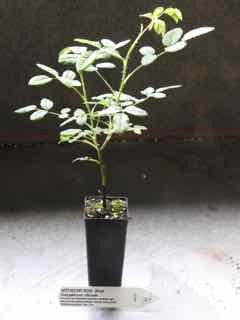 Apothecary Rose plant is naturalised to France, but native to Turkey and Iraq and prefers loamy soils in a protected, sunny position. Frost resistant but drought tender. Herbaceous perennial growing to 1.5m x 1.0m. Single, purple-pink flowers in late spring. Be the first to review “Rose, Apothecary plant” Click here to cancel reply.